A Bear Call Spread strategy involves selling a Call Option (Short Call) with a Strike Price closer to the current market price and buying another call that is further away (Long Call). An alternative name is a Bear Credit Spread. A Bear call spread is the opposite strategy to a Bull Put Spread, but has similar characteristics in terms of risk/reward. Bear call Spreads benefit when the price of the Underlying instrument falls because the Short Call reduces in value and is, therefore, cheaper to buy back (and might subsequently expire at zero). 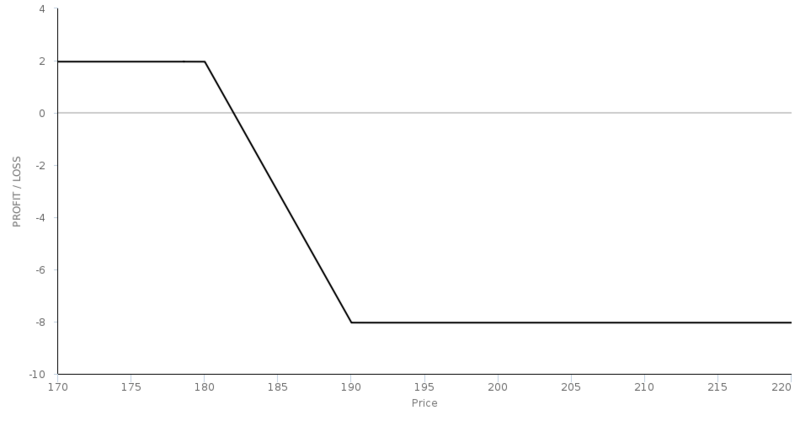 Even if the price of the Underlying rises, providing the market price of the instrument remains below the Strike Price of the Short Call then it is worthless at expiry and the option seller gets to keep all of the Premium they collected when the position was opened. For this reason, Bear call Spreads are sometimes described as being partially non-directional. The trader keeps the $196 credit received. This is the total amount of profit available, irrespective of whether the price had fallen any lower. The trader incurs a loss of ($1050) which is offset by the credit received of $196 to reduce the liability to ($854). This is the total amount the trader can lose. Zacks Investment News presentation with Kevin Matras describing Bear Call credit spreads. OIC guide to Bear Call Spreads. Options Guide Bear Call Spread explanation with an example. Option Alpha overview of the Bear Call Credit Spread strategy. Share Navigator demonstrate the mechanics of the Bear Call Credit Spread strategy. Andy Crowder of Wyatt Research explains the procedure for selling a Bear Call Credit Spread. Option Alpha video describing adjustments that can be made to Bear Call Credit Spreads.